If this post gives you a sense of déjà-vu it’s because, last month, we announced a web-based Sense HAT emulator in partnership with US-based startup Trinket. Today, we’re announcing another Sense HAT emulator designed to run natively on your Raspberry Pi desktop, instead of inside a browser. Developed by Dave Jones, it’s intended for people who own a Raspberry Pi but not a Sense HAT. 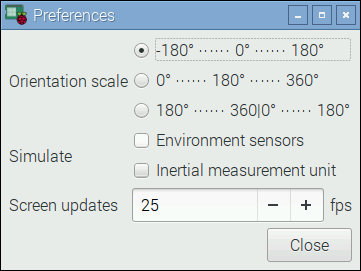 In the picture below, the sliders are used to change the values reported by the sensors while your code is running. So, why do we need two versions? For offline use, possibly the most common way Raspberry Pis are used in the classroom. To accommodate the oldest 256 MB models of Raspberry Pi which cannot run the web version. 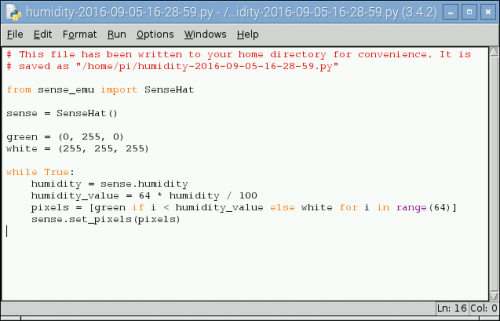 To allow you to integrate your Sense HAT program with any available Python modules, or other Raspberry Pi features such as the Camera Module. You can then access it from the Desktop menu, under Programming. The emulator closely simulates the Sense HAT hardware being attached to your Pi. You can read from the sensors or write to the LED matrix using multiple Python processes, for example. There are a number of preferences that you can adjust to change the behaviour of the emulator, most notably sensor simulation, otherwise known as jitter. This costs some CPU time, and is disabled by default on the low-end Raspberry Pis, but it provides a realistic experience of how the hardware sensors would behave. You’ll see that the values being returned in your code drift according to the known error tolerances of the physical sensors used on the Sense HAT. 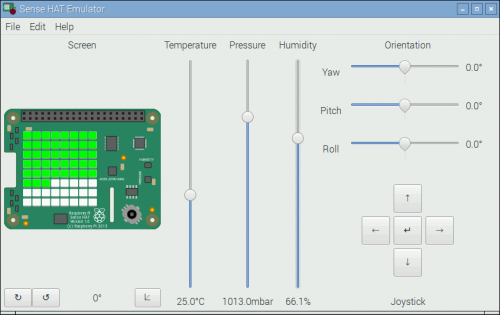 This emulator will allow more Raspberry Pi users to participate in future Astro Pi competitions without having to buy a Sense HAT: ideal for the classroom where 15 Sense HATs may be beyond the budget. So, where do you start? If you’re new to the Sense HAT, you can just copy and paste many of the code examples from our educational resources, like this one. You can also check out our e-book Sense HAT Essentials. For a complete list of all the functions you can use, have a look at the Sense HAT API reference here. You can even install this emulator on other types of Linux desktop, such as Ubuntu! For more information on how to do this, please visit the emulator documentation pages here. Excellent ! Could this be also used in conjunction with a real SenseHat ? Yes, you can have a Sense HAT plugged in and both the python-sense-hat and python-sense-emu packages can be installed simultaneously (this was rather useful during development of the emulator!). I should also mention that there’s a couple of command line utilities included, one of which is called “sense_rec”. This allows you to record sensor values from a real Sense HAT, then replay the recording in the emulator. I’ve got a bit more work to do on this tool (and the emulator for that matter), but it’s already reasonably functional. sounds good ! Hopefully this will ship directly with Raspbian at some point – sounds like a useful thing to have available ! I’m planning to run sense_rec on the Astro Pis on board the International Space Station during some interesting events like when they fire the maneuvering thrusters. Then we’ll be able to let students play these recordings back in the emulator and test that their code can detect those events. I’ve been using an A+ and a 3B (opposite ends of the spectrum) during development to get an idea of how things run. On the A+ it works, but with the full simulation enabled it does eat at least half the processor time (hence why the full error simulation defaults to disabled on BCM2835 based platforms like the A and A+). Without the full simulation it runs acceptably. However, the recording replay function I mentioned above (re: sense_rec) is *far* too heavy for the A/A+ (updating all the sliders as the recording plays is too much work). To that end, there’s a command line replay utility (sense_play) included, specifically for use on these platforms (you can use it on any platform, but it was built to work around the performance bottleneck on the slower platforms). You have a couple of options, either upgrade to Raspbian Jessie (see https://www.raspberrypi.org/downloads/raspbian/) and then you’ll be able to install it through apt-get or, if you prefer to stay on Wheezy, you can install it through pip (see https://sense-emu.readthedocs.io/en/v1.0/install.html). The .deb packages *should* be Wheezy compatible (I deliberately built them on Wheezy for that purpose) but they may only be uploaded to the Jessie repos. However, I should warn that I haven’t tested the system on Wheezy; I try and write code that’s compatible with Python 3.2 (the ancient Py3 version that’s available on Wheezy), but I’ve only got enough time to test on a few platforms. In this case, the emulator’s been tested on Raspbian Jessie (under Py2.7 and 3.4), Ubuntu (Py2.7, and 3.5), and Windows (Py3.4; joystick emulation partially broken due to GTK3 bugs). If you do give it a try and run into bugs, do file a report on the GitHub repo (https://github.com/RPi-Distro/python-sense-emu) and I’ll see what I can do, but I’m afraid Wheezy support isn’t likely to be a particularly high priority. Seems to work on my Pi-Top laptop easily enough. Just have to ensure I have enough room for the Pi-Top Proto-Board and see if that will run a Sense HAT module. Excellent, I had noticed it there a few weeks back but thought nothing of it. Assumed it was something to do with the web based version. anyway, this lets me send the kids off testing at home without the need to also given them one of the few SenseHats’s we have at school. Is there a way to loop through a read Sense HATs data? I think that could be very useful for testing to switch to the real hardware with just the click of a button instead of changing and restarting your code (even though it is just a small code change). Also, it would be great to have recording and playback functionalities like in sense_rec directly inside the program. Playback functionality is obviously built-in but recording is a bit trickier as that then means loading both the sense_emu and sense_hat libraries into a single process (should be possible, but have to be careful about that). I should also mention there’s a “sense_play” command line utility so you can script both recording and playback if you want. Oh, and before I forget there’s “sense_csv” too which can convert a recording into CSV format. This is largely intended for debugging / analysis but it might prove useful in ways I haven’t thought of yet. The idea of making a pass-thru to the real Sense HAT is intriguing. I’m not sure how easy/hard that is off the top of my head, but I’ll have a look at it in future. What sense could a Sense HAT make if an emulated Sense HAT could be sensed? How would I get this working on a Windows(10) setup, since that’s much easier to use in a school with all the children. Then they can be let loose on the Pi’s when they want to transfer it across. I have had Python installed from python.org installed (v3.5 iirc, whatever it gives as default). The desktop emulator can be made to run on Windows but we’re not officially supporting it because there are bugs in the GTK library under windows which cause problems with the joystick buttons. They are online since they are school computers used for teaching. We have plenty of these and few Pi’s, hence it is much better to learn and test on these desktops and move and test on the Pi ‘in the real world’. Trinket gives no useful information for debugging. It’s fine for some simple LED tinkering, but nothing actually useful beyond that. Unless I’m missing something. I assumed a full python install would be more flexible. Shame the cross compatibility is not there with python. Luckily Joysticks are not something we’re bothered with. See my comment below. Basically, cross compatibility *is* there with Python … not so much with GTK3 though which is what the GUI portion of the emulator is built upon. 1. Install Python 3.4.4. PyGObject isn’t packaged for 3.5, so you can’t use that, and Python 3.4.5 doesn’t have a binary build on Windows (for no apparent reason) so you’re stuck on the old version. Make sure there’s no other python versions installed or the PyGObject installer (below) gets confused, and ensure 3.4.4 is included in the PATH when installed. 2. Install PyGObject for Windows. Windows seems to be a distinctly second-class citizen in Gnome (in marked contrast to Qt) so the builds are from some random Sourceforge page. You want the latest build which at the moment appears to be 3.18.2 rev9. When the installer presents an enormous list of packages to you, make sure Gtk and Gdk are selected (I don’t recall needing anything else – all the other dependencies of those were automatically pulled in). It doesn’t get added to the Start menu as that would require plenty more work (basically, that gets us into the realm of building a full Windows installer and uninstaller). As you’ll discover, various bits of GTK3 are flaky under Windows (the joystick buttons toggle rather than pressing and releasing, the keyboard support for joystick control doesn’t work at all, the sliders don’t smoothly follow mouse control when dragged, etc.) which is part of the reason we don’t want to get into building a Windows installer; that gives the impression that Windows is a supported platform. With the current state of GTK3 on Windows, it’s simply not realistic for us to support the platform officially. Which is not to say we actively work against it: I’ve tried to be careful when building the emulator to ensure I’m not doing anything which’ll outright fail on Windows, but support is very much “unofficial best effort”. Ah, there’s the reason. It’s a little harsh though (reads a bit like “we’ll release security fixes for this, but to strongly encourage you to just upgrade to another version we won’t build the binaries for you”). Still, 3.4 is pretty outdated at this point and I can understand their desire not to expend resources supporting outdated versions. The issue is more that Gnome’s Windows support seems to be lagging, hence forcing the outdated version of Python. Looks like a job for me to try at home and see if it is usable, before getting the school to have a go. /me hoping they’ve not installed and need the latest python with the Computing/IT classes. can I also write a program in C to connect to this emulator, or must it be Python? Can I use sense_rec for recording every second and not at 60 hertz? Play with a free Sense HAT in your browser!